Gutters by Ryan Sohmer, Lar deSouza, et al. The prestigious Harvey Awards have released their 2011 nominees for excellence in the comics industry. Named after the influential cartoonist Harvey Kurtzman, founder of MAD Magazine, the Harvey Awards are the only comics industry award both nominated and selected by comic book creators, those who write, draw, ink, letter, color, design, edit and/or otherwise help create comics. This year showed an unprecedented number of nominations from web comics and digital comics, with a total of eight different works getting recognized in multiple categories. Most significantly is the showing from Gutters, which is nominated for a startling six nominations, more than any other single creator or comics work whether in print or not. The web comic that satirizes the comics industry appears to have won a significant number of fans within the industry, as it has been nominated for Best New Series, Special Award for Humor in Comics, Best Online Comics Work, Best Writer (Ryan Sohmer), Best Artist (Ed Ryzowski), and Best Colorist (Ed Ryzowski). The digital comic Box 13, originally released through ComiXology, also had a decent showing, with two nominations: Best Letterer (Scott Brown) and Best Inker (Steve Ellis). Comfort Love and Adam Withers also received two nominations, one for Most Promising New Talent for their web-comic Rainbow in the Dark, and one for Best Anthology for their Uniques Tales. The remaining Best Online Comics Work category had the following nominations: Guns of Shadow Valley by David Wachter and James Andrew Clark; Hark! A Vagrant by Kate Beaton; La Morté Sisters by Tony Trov, Johnny Zito and Christine Larsen; and PvP by Scott Kurtz, who will be the Master of Ceremonies at the award show at the Baltimore Comic-Con in August. Last year’s Harvey Awards only saw 3 categories outside of the Best Online Comics Work category nominate digital and/or web comics. The Best Online Comics Work category was added to the Harvey Awards in 2006. On the print side of thing, this year’s Harvey Awards gave five nominations to Darwyn Cooke and his adaptation of Richard Stark’s Parker: The Outfit. Writer Joshua Hale Fialkov won four nominations for his work in Echoes with artist Rashan Ekedal and Tumor with artist Noel Tuazon. Tumor is nominated for Best Graphic Album Previously Published; it was originally published digitally on the Kindle in 2009. Artist Jaime Hernandez (Love and Rockets: New Stories) and Thor: The Mighty Avenger by Roger Langridge and Chris Samnee each had three nominations, with an additional nomination each for The Art of Jaime Hernandez: The Secrets of Life and Death, edited by Todd Hignite, and Langridge for his writing on The Muppet Show comic book series. IDW Publishing raked in 16 nominations, more than any other publisher. Marvel Comics brought in 13, including 1 from their Icon imprint. DC Comics and Image Comics both obtained 11 nominations each with their respective Vertigo and Top Cow imprints bringing in more than half. Complete list of Harvey Comics 2011 nominations. Last November I talked about innovation and creativity with digital comics on the iPad and other mobile devices. Thanks to Twitter, I recently stumbled upon what looks like an amazing example of what I was talking about that launched in December. With positive press from PBS, The New York Times, ICv2 and Graphic Novel Reporter, this is bound to be just the beginning of this kind of innovation that still uses the language of comics and might even bring it to a new level. For you traditionalists, fear not. A print version is planned. Never read a graphic novel before? Haven’t read a comic book in years? Here’s some brand new stuff that came out the week of September 30 that I think is worth a look-see for someone with little to no history with comics. That means you should be able to pick any of these up cold without having read anything else. So take a look and see if something doesn’t grab your fancy. If so, follow the publisher links or Amazon.com links to buy yourself a copy. Or, head to your local friendly comic book shop. Disclaimer: For the most part, I have not read these yet, so I can’t vouch for their quality. But, from what I’ve heard and seen, odds are good they just might appeal to you. The first and only illustrated biography of “The Man in Black”, Johnny Cash, the most famous country singer of all time. Cash was a 17-time Grammy winner who sold more than 90 million albums in his lifetime and became an icon of American music in the 20th century. Graphic novelist Reinhard Kleist depicts Johnny Cash’s eventful life from his early sessions with Elvis Presley (1956), through the concert in Folsom Prison (1968), his spectacular comeback in the 1990s, and the final years before his death on September 12, 2003. The author’s site has a preview (although the final lettering is missing). I love that image of Cash in the recording studio. The innovative, dramatic graphic novel based on the life of the philosopher and mathematician Bertrand Russell. This brilliantly illustrated tale of reason, insanity, love and truth recounts the story of Bertrand Russell’s life. Raised by his paternal grandparents, young Russell was never told the whereabouts of his parents. Driven by a desire for knowledge of his own history, he attempted to force the world to yield to his yearnings: for truth, clarity and resolve. As he grew older, and increasingly sophisticated as a philosopher and mathematician, Russell strove to create an objective language with which to describe the world – one free of the biases and slippages of the written word. At the same time, he began courting his first wife, teasing her with riddles and leaning on her during the darker days, when his quest was bogged down by paradoxes, frustrations and the ghosts of his family’s secrets. Ultimately, he found considerable success – but his career was stalled when he was outmatched by an intellectual rival: his young, strident, brilliantly original student, Ludwig Wittgenstein. An insightful and complexly layered narrative, Logicomix reveals both Russell’s inner struggle and the quest for the foundations of logic. Narration by an older, wiser Russell, as well as asides from the author himself, make sense of the story’s heady and powerful ideas. At its heart, Logicomix is a story about the conflict between pure reason and the persistent flaws of reality, a narrative populated by great and august thinkers, young lovers, ghosts and insanity. The Amazon.com link above has previews and the Bloomsbury link above has three-part making-of video series on YouTube, but there’s also an excellent website at Logicomix.com with behind-the-scenes info, a preview trailer and lots of other info. This debuted at #1 on the New York Times Best Seller List and is getting excellent reviews. First BOOM! Kids issue! One of the longest-lived, most-successful comic book series in the industry’s history comes to BOOM! and brings a little magic — presenting Wizards of Mickey! Student of the great wizard Grandalf, Mickey Mouse hails from the humble village of Miceland. Allying himself with Donald Duck (who has a pet dragon named Fafnir) and team mate Goofy, Mickey’s come to the great tournament to get his revenge on Peg Leg Pete, who has stolen the Rain Crystal from Miceland! Join Mickey Mouse and his friends on an epic tale of magic and wonder! Join BOOM! Kids for a whole new epoch in Disney publishing! Disney comic books have been missing from the market place for about a year now. This is an imported story, which has been a pretty standard practice for previous publishers of Disney comics. It was originally done in Italy but from the looks of this preview, the translation holds up pretty nicely. The first winner of Zuda Comics’ monthly online competition, HIGH MOON is a horror adventure of cowboys and werewolves in the Old West. HIGH MOON begins with a gruff bounty hunter, Matthew Macgregor, investigating a series of strange happenings in the dusty town of Blest, Texas. While Macgregor seeks to uncover the town’s dark secrets, he tries desperately to keep his own hidden. The horrors of Blest ripple out to the mountainous town of Ragged Rock, Oklahoma, where another detective investigates a series of murders following a bizarre train robbery. Uncovering an age-old vendetta, this mysterious lawman is forced to do battle with a steam-driven monstrosity. Macgregor’s tale concludes as a young woman’s dire call for assistance leads him through the Black Hills of South Dakota and into devastating battle between two warring factions. Macgregor must face down the United States government – only to discover a secret ritual that spells the destruction of the American frontier. It’s such a relief when someone you personally know releases something, and you can be genuinely complimentary of what they’ve produced. While David Gallaher and I have “virtually” known each other for years, I’m happy to say that his web-comic holds up nicely as a thrilling horror/western mash-up. You can read it for yourself right here. And then there’s this production blog for good behind-the-scenes goodies. A crime fighter is genetically engineered to be a super-hero – but when the test goes awry and he doesn’t have the super-hero qualities needed, he has to be teamed up with a former CIA agent who is the brains behind the duo. One gets all the glory while one has all the power. I’ve always thought that it was a bit weird that every super-hero just instantly has what it takes, mentally and emotionally, to actually be a superhero. I guess I’m not alone. Probably not one for the kiddies. The Dynamite link above has a 9-page preview so you have a better idea of just what you’re getting into by entering one of Howard Chaykin’s worlds. Prison Pit is an original graphic novel from the pen of Johnny Ryan, best known for his humor comic, Angry Youth Comix. Prison Pit represents a marked departure from AYC or his Blecky Yuckerella weekly comic strip, combining his love for WWE wrestling, Gary Panter’s “Jimbo” comics, and Kentaro Miura’s “Berserk” Manga into a brutal showcase of violence, survival and revenge. Imagine a blend of old-fashioned role playing fantasy games like Dungeons & Dragons crossed with contemporary adult video games like Grand Theft Auto, filtered through Ryan’s sense of humor. The book begins with C.F. (his full-name would be too horrifying to reveal here) being thrown into the Prison Pit, a barren negative-zone populated by intergalactic, violent monster criminals. In this first volume, C.F. gets into a bloody slorge war (a slorge is a giant slug that excretes a steroid-like drug called “fecid” that all the monster men are addicted to) with ultraprisoner Rottweiler Herpes and his henchmen Rabies Bloodbath and Assrat. The ensuing bloodbath is an over-the-top, hyperviolent yet hilarious farce worthy of Ryan’s inspiration, Kentaro Miura. If Howard Chaykin is too much for you, you’ll never be able to handle Johnny Ryan, who is maniacally funny in the absurdly over-the-top violence. Here’s a PDF file preview. The world is dying. After most of the city succumbed to the plague, Welton’s staying inside — permanently. But hiding in his claustrophobic basement room — the only place he knows is safe — exacts a gruesome price, and he becomes part of a collective that’s killing children. Infected with the plague himself, with no way to find the woman he loves, Welton takes refuge in apathy — until someone knocks on his door. Ball Peen Hammer gives us a window into life in a half-deserted apartment building in a time of raw love, sacrifice, fear, and death. This one is a bit more serious but also not for the weak at heart. Here’s a 13-page preview. Fathers, sons, and the war that comes between them. There’s nothing Josh, Cody, and Gordon want more than their fathers home safely from the war in Iraq — unless it’s to get out of their dead-end town. Refresh, Refresh is the story of three teenagers on the cusp of high school graduation and their struggle to make hard decisions with no role models to follow; to discover the possibilities for the future when all the doors are slamming in their faces; and to believe their fathers will come home alive so they can be boys again. The above says enough to get me hooked. But for more, here’s an 11-page preview. Trotsky was a hero to some, a ruthless demon to others. To Stalin, he was such a threat that he warranted murder by pickax. This polarizing figure set up a world conflict that lasted through the twentieth century, and in Trotsky: A Graphic Biography, the renowned comic artist Rick Geary uses his distinct style to depict the stark reality of the man and his times. Trotsky’s life becomes a guide to the creation of the Soviet Union, the horrors of World War I, and the establishment of international communism as he, Lenin, and their fellow Bolsheviks rise from persecution and a life underground to the height of political power. Ranging from his boyhood in the Ukraine to his fallout with Stalin and his moonlight romance with Frida Kahlo, Trotsky is a stunning look at one of the twentieth century’s most important thinkers and the far-reaching political trends that he launched. Rick Geary does excellent work. Unfortunately I can’t find a preview but just imagine looking at something really impressive that compels you to buy it. Now in its fourth year, Best American Comics showcases the work of both established and up-and-coming contributers. Editor Charles Burns—cartoonist, illustrator, and official cover artist of the Believer—has culled the best stories from graphic novels, pamphlet comics, newspapers, magazines, mini-comics, and the web to create this cutting-edge collection. Featuring the work of such luminaries as Chris Ware, KAZ, and Robert Crumb, this volume is “a genuine salute to comics” (Houston Chronicle). This is a highly acclaimed yearly anthology that provides a great sampling of the depth and art of comics. Here’s the book’s official site which has more information. From Creation to the death of Joseph, here are all 50 chapters of the Book of Genesis, revealingly illustrated as never before. 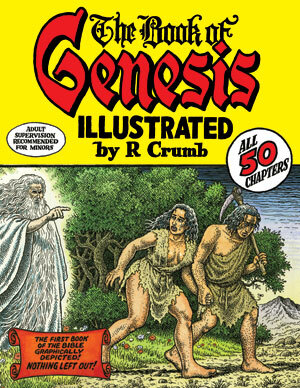 Envisioning the first book of the bible like no one before him, R. Crumb, the legendary illustrator, reveals here the story of Genesis in a profoundly honest and deeply moving way. Originally thinking that we would do a take off of Adam and Eve, Crumb became so fascinated by the Bible’s language, “a text so great and so strange that it lends itself readily to graphic depictions,” that he decided instead to do a literal interpretation using the text word for word in a version primarily assembled from the translations of Robert Alter and the King James bible. As Crumb writes in his introduction, “the stories of these people, the Hebrews, were something more than just stories. They were the foundation, the source, in writing of religious and political power, handed down by God himself.” Crumb’s Book of Genesis, the culmination of 5 years of painstaking work, is a tapestry of masterly detail and storytelling which celebrates the astonishing diversity of the one of our greatest artistic geniuses. A surprisingly reverential and straight adaptation from one of comics’ most influential humorists. Here’s a preview of chapter 19. Pretty big week for comics. Lots of good stuff to check out.